'Near-Normal' Atlantic Hurricane Forecast Could Mean More Storms : The Two-Way The past three hurricane seasons have been considered below normal, the National Oceanic and Atmospheric Administration says. This season, NOAA predicts about four to eight hurricanes in the Atlantic. 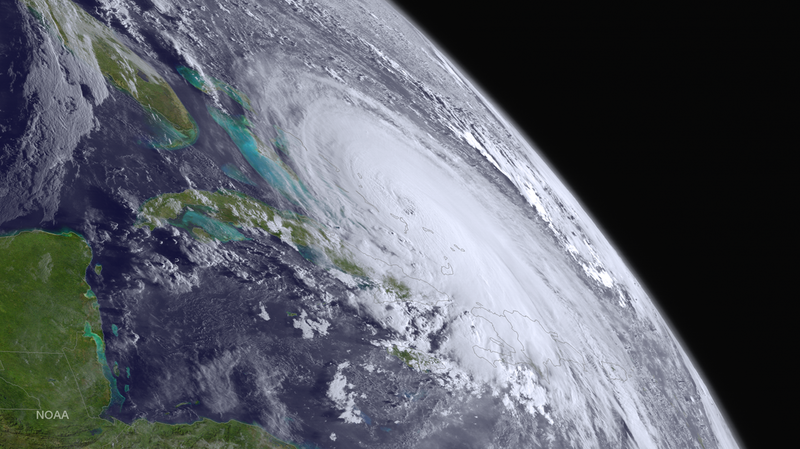 Hurricane Joaquin seen in a satellite image on Oct. 1, 2015. "In the Atlantic, the season will likely produce a range of from 10 to 16 tropical storms. Four to eight of those are expected to become hurricanes," says NOAA Administrator Kathryn Sullivan. There could be one to four major hurricanes — Category 3 or higher and with winds of at least 111 miles per hour. "Near-normal" in this case actually means there might be more activity than there has been over the past three years, which NOAA describes as "below normal." For the central Pacific, forecasts have predicted four to seven tropical cyclones, the NOAA statement says. Six to 11 hurricanes are likely in the eastern Pacific, including three to six major hurricanes. NOAA says this year is particularly difficult to predict because of uncertainty about "climate signals" that impact how storms develop. The administration is upgrading its tracking technology, though. Earlier this month, it unveiled a shift to 4-D models with its U.S. Global Forecast System. As Engadget explained, "The agency has added 'time' as a fourth dimension to its weather and climate model, allowing GFS to make hourly forecasts for up to five days out." Previously, forecasts came every three hours. Later this year, NOAA says, the system will also be able to display satellite images of weather patterns "as frequently as every 30 seconds."